Today’s discussion is Peace, and we have heard scripture which enlightens us to seek peace. However, scriptures also give us an image of peace that does not come from the worldview of peace. For example, when someone is fighting it requires a treaty of peace between the parties to become ‘peaceful’ again. However, for many, especially when we view how America got its start and to break away for Britain the citizens became rebellious, that is to say, the citizens of America no longer stood with or for what their forefathers represented. 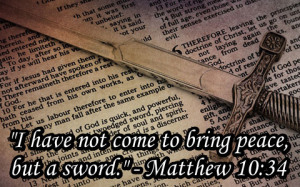 In biblical view Yahusha is quoted as saying, “I come not for peace [or prosperity] but with a sword” which is direct, and great contrast to what we have been given that peace is among us.